Slash Casual’s DigiClock Pro is a worthwhile investment for those who want a multifunctional alarm clock. It does more than just tell you the time. With DigiClock Pro, you’ll have an alarm feature (where you can set multiple alarms), thermometer reading (with metric or imperial measurements), customizable display, and flashlight. This nifty gadget is better than the default iPhone Clock in some ways, but it blows away competitors like Time Flow. With the DigiClock Pro, you’ll wake up to alarm sounds of your choosing. Pick from 9 classic sounds or select something you’ll look forward to waking up to from your music library. 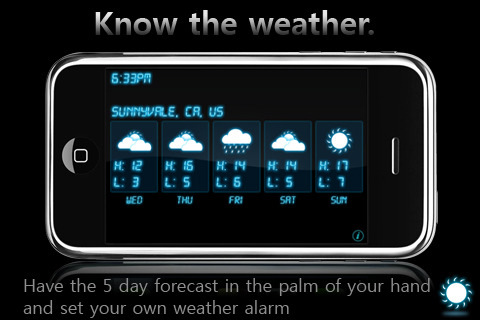 My favorite feature is the ability DigiClock Pro provides to optimize your wakeup experience according to the weather. You can check boxes for different weather conditions so the alarm with only activate if the restrictions are met. This will provide you some extra help on days when it’s snowing or raining, and ensure you’ll wake up a little earlier and make it on time to your destination. For the feature to work, you need to be connected to a 3G or wi-fi network. Another great feature is the 5-day weather forecast. It shows different conditions for your location at the tap of a button. And when you shake the iPhone, DigiClock Pro will transform your screen bright white which works like a flashlight for those times when it’s dark outside. This app offers a simple interface and controls. No matter how you customize the display, the screen will never look cluttered. You can also choose to display a 24-hour clock or go with the 12-hour option. There’s also the option of showing or hiding the current day and weekday. The clock looks good in portrait and landscape modes. The app is also responsive to finger movements: sliding your finger up/down will dim or brighten the screen. This is a great feature for those of us who share a room with light sleepers who might be disturbed if we checked the time. Those who are sight challenged in the morning will also appreciate the large snooze and sleep buttons. Slash Casual released a polished app. I just wish they offered a larger color selection. The 5 colors–cyan, green, orange, pink, and red–are too limiting. I don’t like how most of the colors look, and would like a white option to create a more classic look. Other gripes I have include the fact that the app must be running for alarms to work. It would be nice if the app didn’t have to run because if you forget to put the program on before you go to bed, you won’t have it when you wake up. That’s a large minus in my book because you won’t have that problem with the default Clock app. I’d also like to see additional features with future updates. Developers might consider adding a timer feature, stopwatch feature, and world clock. Because I really enjoy these features, DigiClock Pro won’t replace the default Clock until they include these updates. If you’re interested check out the free lite version. With the free version, you won’t be able to use the flashlight, change color themes, view the temperature, or set your music alarm to songs in your library. A look at the free version is still worthwhile so you can judge whether you like the aesthetics enough to drop $0.99 (the introductory price) for DigiClock Pro. AppSafari review of DigiClock Pro was written by Linda Ta on April 1st, 2010 and categorized under App Store, Productivity, Utilities. Page viewed 3908 times, 1 so far today. Need help on using these apps? Please read the Help Page.